Well, college football has finally arrived and I have no idea what to expect from my favorite football teams. Although I'm hoping I won't have to amend my "loss lists" anytime soon. If the Tide and the Brothers Manning are successful this year I'll be happy. All in all, I just hope for a good football season. Lately, I've been getting more into buying physical manga editions and I'm finding the pursuit much more rewarding than digital editions. 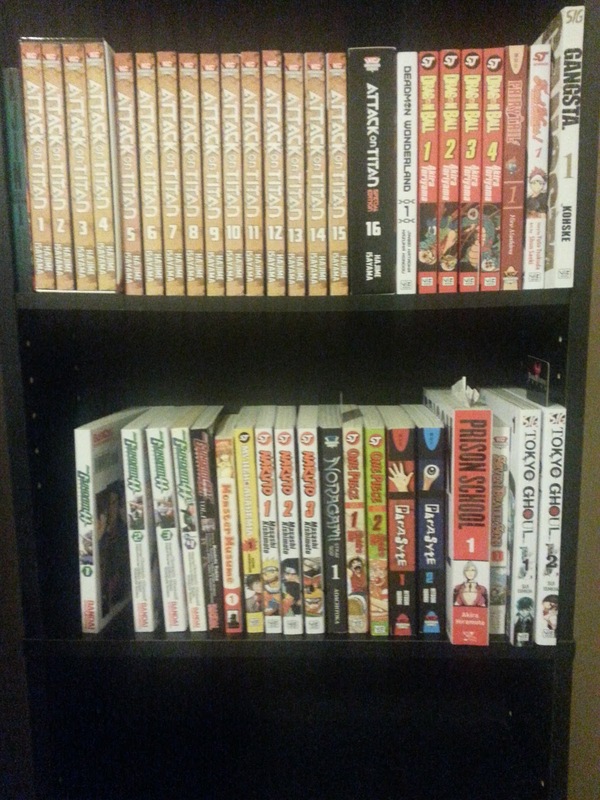 Novels I can take or leave in physical format, but manga is so much better in paper form. Which means I'm going to need a few more bookcases before too long. I've only just started and I've already built up a tidy little book shelf's worth. 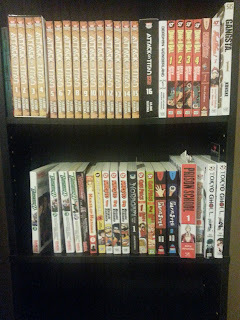 As you can see, some titles I have double dipped on with the digital editions: Attack on Titan, Dragonball, One Piece, and Naruto. With 42 volumes for DB, 72 for Naruto, 75+ for One Piece, and AOT still going, it's really going to be something when this collection really gets going. On another note, I'll finally be taking a vacation from my "real job" this month. I'm really excited about that. I don't really plan on doing much of anything special, but it'll be my birthday so I'm sure I will do stuff. Hard to believe I'll be 25 in less than a month. It's also hard to believe I'm an assistant manager at my job. How the hell did I get in management? It's even harder to think I'm still at the same place I've been for over three years. It's hard to believe that I am where I am today. Back to the books, I'm really enjoying the first volume of Prison School right now and I look forward to pursuing that series further. The anime should be good, too. I can't wait. Still glad I keep that Funimation subscription handy. Although I'm slightly worried about how much I'm enjoying this rather masochistic sexual-themed story. I'm also revisiting the Ghost in the Shell: Stand Alone Complex series on DVD. Accel World, Psycho Pass II, and Full Metal Panic: The Second Raid are next on my anime queue. I love Fall and Winter. It's as close to a break from the intense Mobile heat. I'm a guy that would rather deal with cold than heat. If it's cold I can put on a kickass Attack on Titan jacket, some gloves, and an AC/DC beanie. But if it's hot then it's just hot and humid and miserable and I can only sit in my room in my jammies with a fan on and feel like I'm going to melt. Anyway, I just wanted to check in. I'll try to keep more posts coming. I had been slacking off here lately because of work-related issues, but I'll have some much-needed time off coming up. I feel like pinching myself.